Unless you have experience editing photos, it can seem daunting at first. Not only are there a lot of technical terms in photo editing, but even the interface and controls of most editors assume that users have a certain amount of expertise. The good news is that you’ll have to endure none of that in Movavi Photo Editor, and unlike other editors you may have come across it is designed to be user-friendly and simple. In fact the user interface of this photo editing software is clean, simple, and easy to navigate so you should have no problem finding any of its features. The features in Movavi Photo Editor will let you perform a variety of different types of improvements on any of your photos or images. To start with you could process the image to enhance its quality by manually adjusting the color settings or using the automated ‘Magic Enhance’ feature to improve them with a single click. After that you can move on to the frame and composition. In Movavi Photo Editor you’ll be able to easily flip, rotate, resize, level, or crop the frame to alter it. On top of that you can also edit the composition directly by removing any unwanted objects, people or other elements that are in the way – or even removing and replacing the background entirely. If you’re editing a portrait or ‘selfie’, you’ll find that there are numerous tools that can help you retouch your photo. Some of these tools will help you to remove blemishes, smooth wrinkles, or erase scars, while others will let you apply digital makeup, alter your hair or eye color, whiten your teeth, and much more. In some cases you may want to transform the style of your photos and make it look visually unique, and if so you should try out the filters and effects in Movavi Photo Editor. On the other hand if you want to add captions or other text to your photos you can easily place text frames and customize their appearance as well. 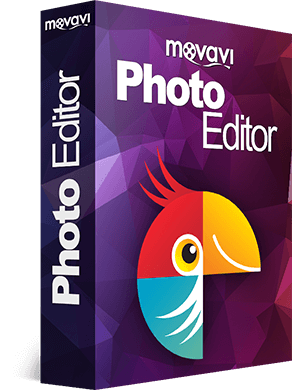 As you can see Movavi Photo Editor will give you everything you need to edit your photos and images from tip to toe. On your end you should just think about what sort of improvements you want to make to your photos, and you can then rely on it to perform them without any hassle.